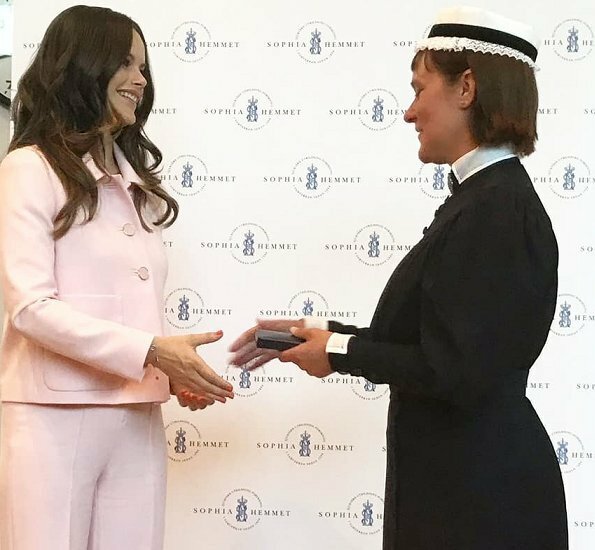 On May 28, 2018, Princess Sofia of Sweden attended "The Sophia Party" and presentation ceremony of Medals of Merit to Sophia Sisters at Sophiahemmet in Stockholm. The Princess presented the Medals of Merit of nurses who have succesfully completed their education at Sophiahemmet College. Princess Sofia wore a new pantsuit (Briani Jacket and Yasna Trousers) by SAND Copenhagen. omg, usally I like Sofias outfits a lot, but this time.. it's just awful.. that suit looks more like a pyjama and doesn't fit well. The colors is quite nice but the fitting??? Looks 2 sizes too big. This would be better for someone like meghan, very thin, in order to look fuller. Lovely pink suit on Pss Sofia today,the pant has the perfect lenght. The jacket for a small or better said short jacket the straight cut makes it look bitter then it is plus the oversize pockets, but she looks good. I believe Sofia is pregnant again. She's wearing her clothing too big again and she always does that whenever she is in her first trimester until her pregnancy is announced. That is exactly what I think too! The jacket overrides and draws off the attention from the waist because you look first to the jacket. Anyway, I don't like this suit for her. She can do better! thought the same, but there are much better ways to hide a little bump than this.. The jacket is too short and the wide pant style is not flattering in her. Letizia recently wore a white outfit of wider pants with a longer jacket. It looked stunning on her. Note to website admin, King Felipe and Queen Letizia welcomed the crown princess and prince of Romania today. While Leti's dress at this meeting is not my favorite, I would like to see pics on this website. I agree with you. Wide pants can look great and they seem to be en vogue. Letizia looked stunning in this white suit, Madeleine looked good in a similar cut suit and baby blue is her color anyway but for Sofia this cut does not work. She needs longer jacket and the pale rose washes her out. About Pss Sofia being pregnant I thought the same but did not want to say anything maybe you are right will see. Until the next time. I thought that she is pregnant too. But I don't know. If she really was pregnant I think she would hide her bump properly until the announcement. But this jacket is seeking for attention to the bump area so maybe it has just an unfortunate cut and she is not pregnant. Although I would be really happy if she was pregnant! Interesting how the same colour can seem so different, like on the top picture and on the other two. Anyway too short jacket, makes the upper part of the trousers look strange. But the rest is quite nice, although I don’t love the colour. Princess Sofia of Sweden looks very wonderful. Pretty colour but the wrong size and I think it would look better with a longer, more fitted jacket. Personally, I think short jackets are better in a contrasting colour or pattern. Awful ensemble. She is tooooo short to wear wide pants. Hair, blah, teenage hair cut. She desperately needs a hair trim. Her clothes are good quality, but she needs a stylist to help with fitting and coordinating her best look. She wore a lovely black skirt and top recently, but you could see the white underwear under the top. She looks like throwback to the 1970's. Awful outfit. Her hair with all the extensions she uses, not high class, not even low class. I don't think she uses extensions. It's probably her own hair.